sailboat. : Some Monday Morning Thoughts | Childhood Drawings, Unbreakable Vows and Chocolate for Breakfast. Some Monday Morning Thoughts | Childhood Drawings, Unbreakable Vows and Chocolate for Breakfast. 01. In uncovering a box of things from my childhood I discovered this masterpiece by 4 year old Jennie. I'm not sure where this particular idea came from, maybe I just really liked potatoes at the time. 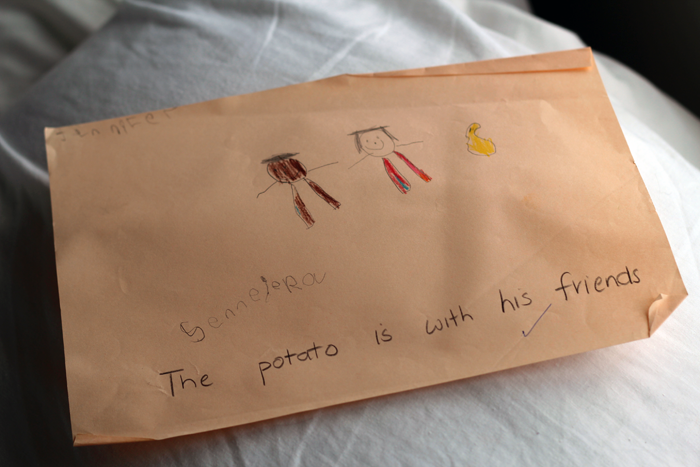 But, you know, potatoes can have human friends too, right? I believe that's me in the middle, my best friend from nursery is on the left and the slightly misshapen, luminous yellow, potato is in our gang. At least we look happy, despite having no bodies! 02. I have well and truly failed at keeping up with replying to comments. I need to get better at this, so I am hereby taking the unbreakable commenting vow - effective immediately. 03. The Balance Me BB Cream* is really, really nice. It's very sheer and a little too dark for my ghostly complexion, but I've been using it underneath my tinted moisturiser for some SPF and a little colour and loving it. 04. An Alpro dark chocolate flavoured dessert pot made the best Monday morning treat breakfast ever. I'll have fruit tomorrow though, I promise. 05. Monday marks the start of week that will bring many new challenges. It can feel a little daunting but challenges also bring accomplishments. And a sense of accomplishment is priceless because it's one that has to be earned. Bloody love those Alpro pots. Live a little - they're fab! I think chocolate for breakfast should be mandatory! That picture is hilarious, you must of really liked potatoes! I really like the Alpro dessert pots, i'm yet to try the dark chocolate one though! Alpro & chocolate are a match made in heaven for sure, nothing comes close! I usually have real chocolate for breakfast XD It's bad.